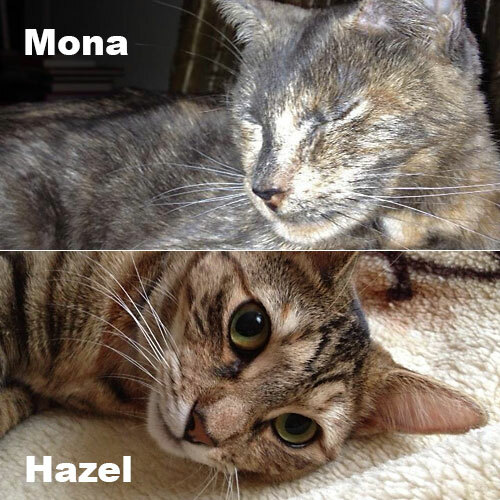 Mona and Hazel’s Story | For Animals Inc.
As a For Animals volunteer, one of my favorite jobs is working an adoption event. Sometimes we show kitties who haven’t been named yet, and I love christening them with fun and creative names. As I was setting up for an event in October 2011, out of the carrier came three little kittens. I named the tuxedos Salt and Pepper, and the little tortie Cumin. Salt and Pepper were quickly adopted that day; little Cumin, however, was very shy and needed a lot of cuddles. I emailed a photo of her to my husband and he fell in love with her at first sight. Cumin, renamed Mona once we adopted her, was a beautiful, shy baby. We quickly gave her a million nicknames such as Baby Girl, Baby Noni, Baby Banones, and we loved her dearly. A year later, she started to show signs of an illness that had been lying dormant in her system from birth. For four months we took her to the vet every week, gave her a plethora of medications daily, and learned how to administer IV fluids to her at home. We watched her lose weight, lack energy, and get sicker by the day. Her poor little body finally decided she had fought as long as she could: one night we went to the emergency vet together, but she didn’t come home. In 34 years of caring for and working with cats, I have never been more devastated. Water eventually smooths rough stones, and as it does life moves on. Four weeks later For Animals rescued a tiny bundle of a six-month-old torbie from the streets of Queens, and she made her way to the shelter. Hazel was a feisty, loveable little girl who needed a home. As soon as we saw a photo of her we went right to the shelter to meet her. A higher feline power spoke to us and told us she was the right cat to join our family and help us move on from losing Mona. We even thought that they might have similar temperaments. Hazel decided to embody the polar opposite of anything we expected! She is a cannonball, a troublemaker, a feline rocket, a firecracker, a lunatic. She has two speeds: fast and faster. She eats more than her fifteen-pound older brother. She builds forts in the bathtub; chews any hair ties she can find; and hides in drawers, in cupboards, and on shelves. She springs like a Slinky, she pads like a ninja. She is the best kind of terror, the sweetest kind of nut. She is our girl.